This fall, a hardcover edition of a comic book called Saga is due to hit store shelves, and the cover features a super-cute alien breastfeeding baby. The first deluxe hardcover edition of Saga, a comic book series written by Brian K. Vaughan and illustrated by Fiona Staples, is due out this November, and it features a stunning breastfeeding cover. Will this be as controversial as the cover of the first issue? 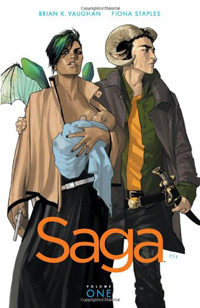 Breastfeeding has long been depicted in art, but when the first issue of Saga came out in 2012, I was surprised to read that some folks had a bone to pick with the cover choice. The cover features the two main characters, one of which is nursing their infant daughter. Most notably, Dave Dorman, a prolific illustrator best known for his Star Wars artwork, actually wrote that he was displeased with the cover choice because it was offensive and not appropriate for children. He actually called it "adult content." A woman breastfeeding a baby… adult content. Okaaay. He initially thought that it would be a perfect comic book series for his 7-year-old son to get into, but there was no way that was happening now. Not with a woman nourishing her young on the cover. Am I right or am I right? First, the series is not written, marketed to or meant for kids. And second, breastfeeding isn't adult content; it's not sexual; it's not inappropriate. As I've written about time and time again, breastfeeding in public is legal and should be viewed by kids — that way they don't grow up to be blowhards who think that nursing women should feed their kids under a cover or, worse yet, in the bathroom. The cover was again used for the first collected paperback (Amazon.com, $6), and amazingly, some retailers were actually covering the image before placing it out for sale. Vaughan and Staples were at the recent San Diego Comic-Con and they specifically addressed both covers. "If your store doesn't like that cover, if you don't want to read a book with that cover, then we're not the book for you," Vaughan said at their panel. And it really doesn't get more simple than that. I'm sure that those who disliked the cover were few and far between (I mean, I really hope so), but the upcoming cover is really perfectly sweet and captures the raw bliss of nursing a baby. I'm sure that those who disliked the cover were few and far between (I mean, I really hope so), but the upcoming cover is really perfectly sweet and captures the raw bliss of nursing a baby. Who can hate on that? And although this baby happens to have horns like Dad, nurturing an infant is the same no matter who you are or what planet you're from. I love it, and I'm glad to see that not everyone feels that breastfeeding should be done out of sight and out of mind. And I can't wait to get my copy.